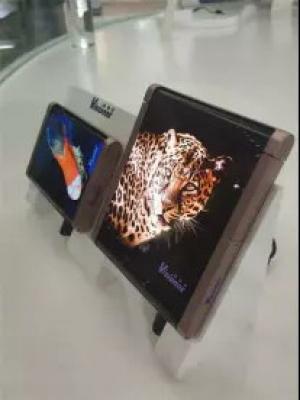 Digitimes reports that four of China's OLED makers (BOE, Visionox, Tianma and EDO) have stepped up their efforts to develop foldable OLEDs, and have all demonstrated foldable prototypes at the China Information Technology Expo 2018 (CITE 2018). First up we have Visionox, with its 7.2" foldable panel you can see above. This was already reported last week. BOE demonstrated a larger panel, a 7.6" one with a bending radius of 5R. The resolution of BOE's panel is 2048 x 1536. BOE says that this panel can withstand 100,00 folding cycles. Here's more information and a video of BOE's panel. Tianma demonstrated a smaller panel - a 5.99" that has an impressive 2880x1440 resolution and a small radius of 3R. Finally we have Everdisplay, with a 5.5" FHD foldable (3R radius) panel.